The fallout from the committee defeat meant there were no members of either Fine Gael or Labour present to debate bank interest rates. 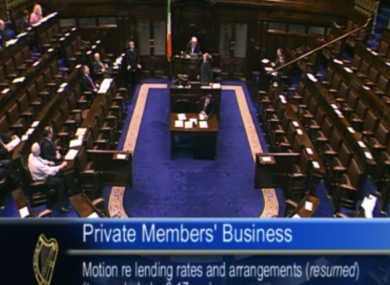 The government benches in the Dáil were completely empty for several minutes during a debate on mortgage interest rates. OPPOSITION TDS this evening tried to have the business of the Dáil suspended in protest at the absence of TDs from the government side. Members were debating a Fianna Fáil motion condemning the difference between the mortgage interest rates levied by various State-owned institutions, particularly Permanent TSB, when Shane Ross proposed a suspension of the Dáil, as there were no government ministers or backbenchers present. The only government member in the house at the time was Fine Gael TD for Dublin South-Central, Catherine Byrne, who was acting as chairman for 15 minutes of the debate. Byrne said she could not agree to a suspension of the House because there were still TDs awaiting an opportunity to speak on the motion, with Sinn Féin’s Michael Colreavy waiting his turn to speak. When Fianna Fáil’s Michael McGrath then asked for a quorum count, wondering whether the minimum number of 20 people were present, Byrne was advised by the Clerk of the Dáil that a vote could not be taken, as the motion being discussed had been tabled by the opposition. Byrne explained to the frustrated opposition benches that government ministers were unable to attend because of some unforeseen circumstances about which she knew little. Many of the government side had been attending the weekly meeting of the Fine Gael parliamentary party, while other TDs were elsewhere discussing the fallout from this evening’s meeting of the Oireachtas finance committee, where the government was beaten in a vote for the first time since taking office. Eventually proceedings continued when junior agriculture minister Shane McEntee returned to the chamber, offering sincere apologies for the emptiness on the government benches. Independent TD Mattie McGrath condemned the government for what he described as a “lack of respect” for struggling homeowners, who he said were “waiting in the long grass” for the government TDs. Email “Opposition TDs slam government absence during Dáil mortgages debate”. Feedback on “Opposition TDs slam government absence during Dáil mortgages debate”.